Peters Participates in National Trumpet Competition | The Gettysburgian. 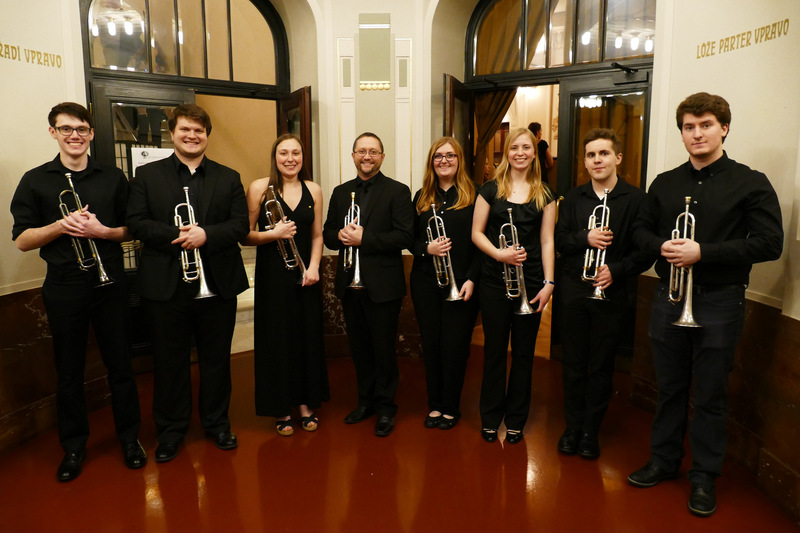 Friday, March 9 was a momentous day for the Gettysburg College trumpet studio and the Sunderman Conservatory of Music. As most students departed campus and headed home for spring break, trumpet player Patrick Peters ‘20 was in Denton, Texas, performing in the quarterfinals of the collegiate solo division of the National Trumpet Competition. The competition, held this year at the University of North Texas, showcases some of the world’s best young trumpet talent and is the largest instrumental music competition in existence. Past participants in the competition have gone on to win Grammy Awards and perform with renowned ensembles like the New York Philharmonic and Canadian Brass. Although Peters did not advance to the semifinals, making it to the live competition was an impressive feat. Peters’ advancement to the quarterfinals was the result of months of intense preparation and practice. His teacher, trumpet professor Dr. Steven Marx, had been encouraging Peters to enter the trumpet competition scene, and the two selected Peters’ piece for the National Trumpet Competition back in mid-October. Marx said that the piece, the first movement of the Gregson Trumpet Concerto, was picked because it is impressive and showcases Peters’ strengths on the trumpet. Since the piece was selected, Marx said, Peters had to practice at least three hours a day to prepare. This was in addition to the multitude of responsibilities that came with being the lead trumpet player of the college’s Wind Symphony and Symphony Orchestra as well as a member of the Jazz Ensemble and the Jazz Dispatch. Peters recorded the piece for the National Trumpet Competition in December, and learned that he had made it to the live quarterfinals round on January 20. Marx said that in preparation for the competition, Peters worked to micro-analyze his playing. In lessons, he and Peters evaluated every phrase of the piece, and the tone and intonation of every note. Their goal was to discover the uber-specific aspects of Peters’ playing, because in a competition with some of the best young trumpet players in the world, the differences between players often come down to details. Marx explained that this was the deepest Peters ever had to delve into a piece and into his trumpet playing in general. This competition meant a lot to Peters, Marx, and the Conservatory. For Peters, interacting and playing with trumpet players from some of the nation’s most famous music schools, like the Juilliard School and the Eastman School of Music, allowed him to expand his professional network within the trumpet world, and talking to professors and representatives from some of those institutions gave him a better idea of what schools he will consider for his graduate-level education. Marx said that competition experience allowed Peters to be better prepared for the competitive audition process for professional orchestras and other ensembles. Additionally, he explained that Peters getting his name out to some of the world’s premier trumpet players and scholars will be extremely beneficial for his career. This experience allowed Marx to come full circle: he was an award-winner at the National Trumpet Competition in 2002 and 2003, and witnessing his own student advance to the quarterfinals of the competition makes him extremely proud. Marx said Peters’ achievement will help continue to increase national and international awareness of the Conservatory among the world’s leading music professionals, and will help make the Conservatory an even more recognizable name. Regarding personal character, Marx believes Peters has the right combination of talent, drive, and humility to have a successful career playing trumpet. He explained how the music field is such a collaborative environment, and that educators are responsible for sending out good people and diligent workers into the music world. Marx was proud to send Peters to the National Trumpet Competition representing Gettysburg College and, specifically, the Sunderman Conservatory of Music, because he has confidence in both Peters’ playing abilities and who he is as a person.